Hold on and enjoy this mild water introduction to rafting in Alaska. You may see moose, sheep, caribou and bear as you raft downstream 11 miles. We recommend that you wear layers suitable for being outdoors for hours at a time. We highly recommend synthetic (fleece, polyester, polypropylene, etc.) or wool materials as opposed to cotton, as they keep you much warmer. We also recommend wool or fleece hats, gloves, and two pairs of socks. 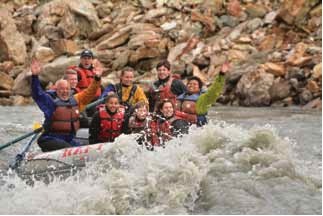 This trip operates from May 20th to September 10th weather and river conditions permitting. Must be 5 or older to take this trip and must be 15 or older to paddle. All participants 18 years and younger must have a release waiver filled out by a parent or guardian. Please note: Transportation to the Denali park meeting location is not included. You must get your own transportation to the park. What to Wear: We provide all our guests with Mustang flotation suits or Gortex dry suits and neoprene booties. Mustang suits are far more insulated, so fewer layers will be necessary for those who opt for them. Dry suits provide no insulation, but provide the utmost of waterproof protection and allow for upper body movement necessary on paddle rafts. We recommend that you wear layer suitable for being outdoors for hours at a time. We highly recommend synthetic (fleece, polyester, polypropylene, etc.) or wool materials as opposed to cotton, as they keep you far warmer. We also recommend wool or fleece hats, gloves, and two pairs of socks. Specific pick up or taxi instructions will appear on your voucher after you purchase your trip. Snacks are not included - you may bring your own. The specific meeting location at your hotel will be listed in your confirmation email and voucher for this excursion. See the 'Redemption and Voucher Details' section below.